On May 14, four teams of NC State student entrepreneurs began a 15-week program designed to help them successfully launch their startup ventures. They were selected from more than 25 applicants for the 2018 Andrews Launch Accelerator Program, said Lewis Sheats, Poole College professor of practice and executive director of the NC State Entrepreneurship Clinic based in HQ Raleigh. The program, now in its third year, is led by Sheats and assisted by Gabriel Gonzalez Orta, program manager at the Entrepreneurship Clinic, and other NC State Poole College entrepreneurship professors. It is designed to accelerate economic development by providing equity-free grants from the NC State Acceleration Fund and pro bono support services to entrepreneurs who complete the Andrews Launch Accelerator. The NC State Acceleration Fund was made possible by a $1 million seed donation made in 2016 by Lyn and Chip Andrews. Chip Andrews, left, listens in on team presentations on the first day of the Andrews Launch Accelerator Program at the NC State Entrepreneurship Clinic. Chip Andrews, who attended the initial session, said the program was “an extraordinary opportunity to broaden the horizons and potential for these student entrepreneurs. All of them and many of their contemporaries have many ideas but making the great idea work is the hard part. What the Entrepreneurship Clinic has done is to develop processes to help them discover not only the opportunities but the challenges along the way,” Andrews said. The student teams will be assigned mentors as part of the launch program. “And they will need multiple mentors because there will be multiple challenges; that will be one of the keys to the success of their discovery,” he said. Meet the 2018 Andrews Launch Accelerator teams. Atomo is building a precise indoor positioning platform available through an application programmable interface. This is a piece of code that will plug directly into any applications existing code, access Atomo’s algorithms, and instantly provide the location data they need. This platform does not rely on beacons, wifi routers, or any specialized external hardware. Team members are Matthew Burke (computer science, ’92), Bryan Cooper (junior), David Flowers (sophomore), Ryan Kelley (mechanical engineering, ’18), all College of Engineering, and Aidan Special (senior), College of Textiles. View their video. Aeva Labs is designing a product that speeds up the aging process of alcohol, allowing breweries, distilleries, and wineries to increase profits, experiment quickly, and scale production in real time. Team members are Steven Guido (mechanical engineering, ’18) and Zach Fearnside (senior, electrical and computer engineering), both in the College of Engineering. Additional team members are Weronika Nowak and Warren D’Costa, both computer engineering (seniors), and Lauren Rapier (junior), College of Design. View their video. BnaFit has developed the first fitness platform which gives fitness trainers the ability to be a star on their own app. With their user interface design, they are giving top trainers the ability to easily create fully functioning workout plans on their own. Clients can now work out with their favorite trainer as if they were both in the same room. Team members are Karly Pavlinac (College of Design, ’17) and Daniel Beall, (College of Engineering, computer science, ’18). View their video. Cup’t is making a bra sizing vest that uses sensors to take accurate measurements. Cup’t provides an application that captures the data collected by the sizing vest and transforms measurements into a list of bra recommendations. Team members are Sarah Alenezi, Madison Baldwin, Erin Furgason, Els Thijs. View their video. Applications for the Andrews Launch Accelerator are available each March for the summer session which runs from May through August. 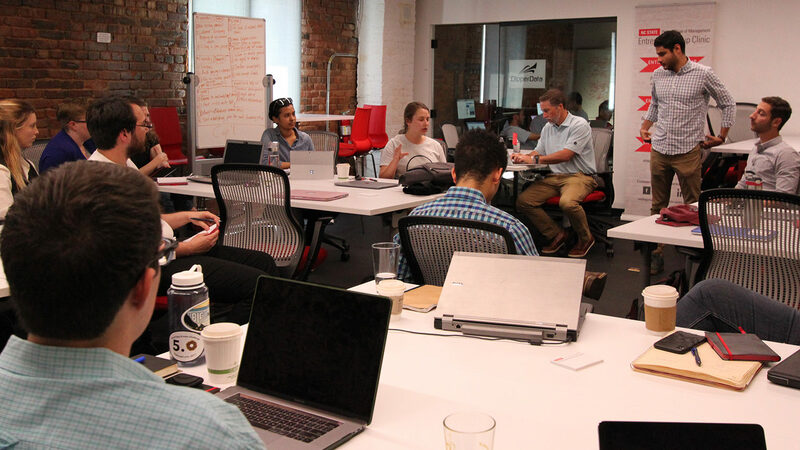 This program is open to entrepreneurs whose startup’s leadership teams have at least one NC State student or an NC State alumnus who graduated within the past two years. The student team members must have either junior or senior standing or be a current graduate student at NC State. Read about the 2017 teams.